The Tar Heel Gem & Mineral Club is a member of the Southeast Federation of Mineralogical Societies, Inc., or SFMS. As its name suggests, the Southeast Federation is an organization of gem and mineral clubs located in the southeastern United States. The Southeast Federation publishes an informative newsletter, the Lodestar, and sponsors a variety of activities to promote interest and participation in geology, mineralogy, gemology, lapidary, and related fields. 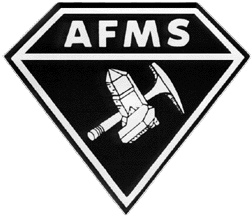 The SFMS website, http://www.amfed.org/sfms, is highly recommended. The club's membership in the Southeast Federation provides insurance coverage for our annual gem & mineral show and for our members on field trips, a prerequisite for access to many commercial quarries and mines. Conversely, your membership in the Tar Heel Gem & Mineral Club satisfies a prerequisite for your participation in many of the Southeast Federation's activities, including the wonderful educational workshops held each year at Wildacres and at William Holland. 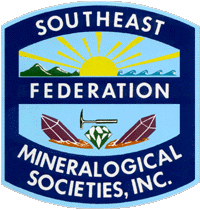 The Southeast Federation, in turn, is itself a member of the American Federation of Mineralogical Societies, Inc., or AFMS. The American Federation is a meta-federation of gem and mineral club federations in the United States. The AFMS website, http://www.amfed.org, is worth exploring. It contains links to websites of the seven member federations, as well as information about activities and newsgroups. The American Federation also maintains a list of websites of member clubs, which can be a valuable source of information about the activities of other gem and mineral clubs in North Carolina.